Since 2012, the Deferred Action for Childhood Arrivals (DACA) has provided security, safety, and freedom of opportunity for over 800,000 people, particularly young DREAMers. But President Trump is moving to eliminate DACA! Our country’s young DREAMers and their families can’t live in the shadows. The bedrock of democracy and key to environmental action is an informed public with the capacity to participate in their communities and in the decisions and policies that affect their lives. A bipartisan DREAM Act would provide a direct road to U.S. citizenship for people who are undocumented or have DACA or temporary protected status, and who graduate from U.S. high schools and attend college, enter the workforce, or enlist in a military program. Speak out today and tell Congress to pass the DREAM Act and protect the future for immigrant youth and our nation. Pass the DREAM Act and uphold protections for thousands of immigrant youth! I strongly oppose President Trump’s decision to end the Deferred Action for Childhood Arrivals (DACA) program. Eliminating the DACA program jeopardizes the safety, security, and future of immigrant youth throughout the nation. 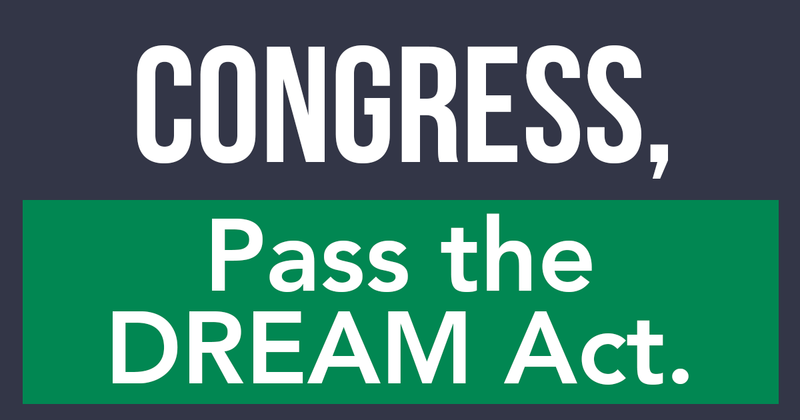 As your constituent, I urge you to support the passage of a clean DREAM Act. The government should be working to increase engagement in our communities and participation in our democracy. Undermining the safety and security of young people is a direct attack on public participation. From concentrated pollution to close proximity to environmental hazards to greater risk of natural disaster impacts, communities of color and immigrant communities face disproportional environmental threats. So, we should be working to elevate the voices of these communities, not pushing them further into the shadows. There is strong bipartisan support for the DREAM Act and maintaining protections for immigrant youth. Please promote policies of inclusion, safety, and security, not hate and bigotry, in our immigration system.